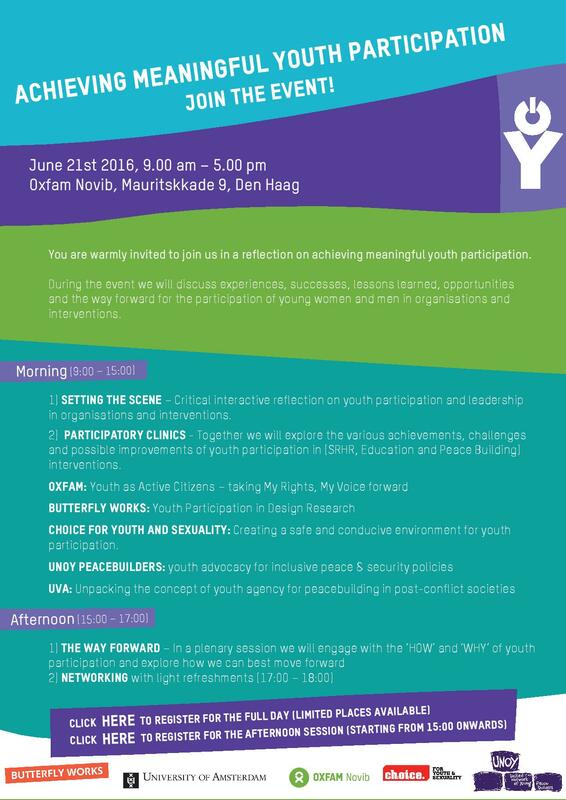 On the 21st of June in The Hague, Oxfam Novib organised a symposium on ‘Achieving meaningful youth participation’ together with the IS Academie Education and International Development, Butterfly Works, CHOICE for youth and sexuality and UNOY peacebuilders. The question that we aimed to answer during this symposium was: How to achieve meaningful youth participation in organisations and interventions? What challenges are faced and which solutions are available? During the afternoon we discussed these issues with representatives from NGOs, the Ministry of Foreign Affairs, the academic world and, naturally, with young people themselves. As a result of this symposium, you can find a learning product here.